Peyton Millirons delivers a pitch against Bartram Trail. The fourth annual IMG Academy National Classic kicked off it’s first week of action on Monday at IMG Academy Fields in Bradenton. The first day saw seven games worth of action between some of the best high school baseball in the state and abroad. The day’s first game saw Jesuit High from Texas play host to the Carrollwood Day Patriots. The Patriots got RBIs from Gabriel Montenegro, Devon Connors and Andre Hevesy but it was not enough as they fell 9-3, thanks to a four-run third and a three-run fifth from Jesuit. The next game also started at 10 AM but lasted well beyond 1 PM, as it took 17 innings to decide the winner between the Osceola Warriors and Cullman High from Alabama. Nick Scordino scored for the Warriors on an error by Cullman in the fifth inning to take the 1-0 lead. Corey Ireson started the game for the Warriors and struck out six batters in seven innings but surrendered his lone run, the tying run, in the seventh to send the game to extra innings. Junior Issac Al drove in the go-ahead run in the 17th to secure the 2-1 victory for the Warriors. Christian Brothers from Memphis, Tennessee, hosted the third game of the morning against the Largo Packers. Christian Brothers jumped out to the early 1-0 lead and never looked back. They added three in the third and two in the sixth and one hit the Packers en-route to a 6-0 victory. Patrick Sanders had the lone hit for the Packers in the fourth. Drew Guido walked twice in the loss. Noah Cosgrove makes a play in the field for the Ascenders. 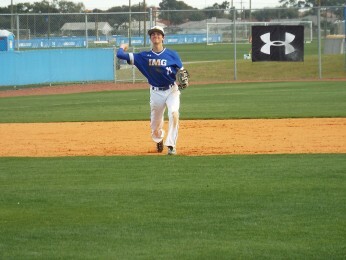 IMG Academy Blue was the away team against the Florida Christian Patriots to kick off the afternoon set of games. The Ascenders jumped out to the early lead when Nathan Fernandez crossed the plate for the first run of the game in the second. A Brandon Billesberger single made the score 2-0 later in the inning. Fernandez scored another run in the third on a two-run single from Trevor Roberson. The Patriots pulled to within one but Chris Messer came in the game in the sixth and closed it out to secure the victory. 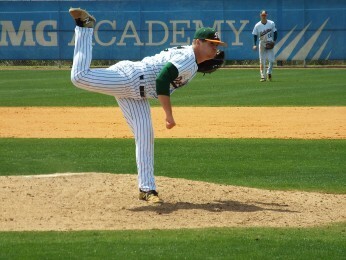 The Mosley Dolphins’ Nicky Agosto and Peyton Millirons combined to shut down Bartram Trail in other round-one action. Agosto went four innings, allowing just three hits and one run. Millirons went three innings, with no hits and no runs. They combined to strike out seven batters en-route to a 4-1 victory. Michael Cullen and JJ Bleday each scored a run for the Dolphins and Ryan Yeager added two. Originally scheduled for 1 PM, the Berkeley Prep Buccaneers and Somerset Academy Panthers had first pitch around 2:40 due to the 17-inning game played on the field prior. Once the action finally did start, it featured two teams among the top 15 in the HSBN Power Rankings and it did not disappoint. The Buccaneers came in having won the week 1 IMG Academy Tournament last year and looked good in defense of their title early when they jumped out to a 3-1 lead. RBIs from Carson Weekley, Gordon Stetson, and Michael Hill along with a strong pitching performance from Tyler Fagler helped build that lead but a late surge from Kenny Moreno-Costa and the Panthers put an end to that. A costly error on the Buccaneers allowed two runs to score in the sixth and then Moreno-Costa’s second double of the game scored Luis Chavez for the go-ahead run. The Panthers held on to win 4-3. The final game of the afternoon saw the Rockledge Raiders host the Dwyer Panthers. The Raiders came into game having not lost yet this season and that didn’t change against the Panthers. The Raiders doubled up the Panthers and won 6-3 to close out the final game of the day.